In keeping up with industry reading it is clear to me that we, as an industry, are perplexed at what to do about branching. The recently released FDIC Summary of Deposits showed the second year of branch decline. The most recent ABA study on delivery channel preference showed online banking eclipsing branch transactions for the 55+ set. That's right... old people letting their fingers do the walking. 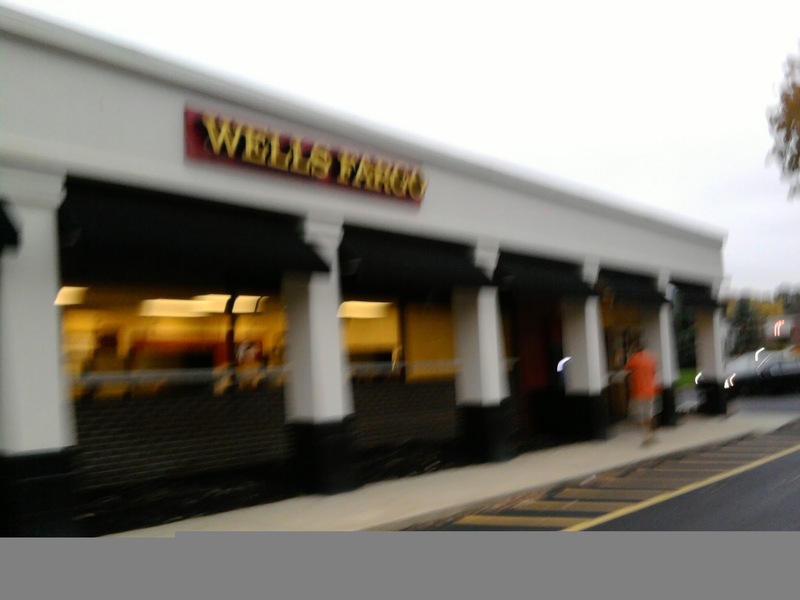 But the #1 or #2 reason cited by small businesses and individuals as to why they select their bank remains branch location. When I ask executives what makes a branch successful or not, the top two reasons continue to be branch location or personnel, not necessarily in that order. Confusing? Yes. But the progressive talk about the future of the branch at times lacks common sense, in my opinion. This dates back to an interview I did with American Banker about a community FI that was opening coffee shop branches. I gave a twofold comment: 1) I saluted the FI for being creative; and 2) I doubted it would work, particularly in the locations and relatively conservative markets where they tried it. AB published the first and the second didn't make the editorial byline. The coffee shop experiment turned out to be a disaster, and the FI was later sold. I recently had a Twitter conversation with a banker about branches that lack tellers. According to feedback from bankers that tried this concept, customers were confused when they walked into the branch. That made sense to me. We like the familiar... i.e. the teller line. But branch transactions have fallen off of the proverbial cliff. Do we need a long line full of bored tellers reading Nora Roberts novels? No. But perhaps we need a couple teller windows to process transactions and bring comfort to those of us that like familiarity. As we evolve, I envision the comfort of knowing there is a branch nearby to continue. But the people who occupy those branches should evolve to those that can open accounts, troubleshoot problems, advise customers, develop business, and occasionally process transactions. This branch will probably be smaller, and less expensive to build out. Smaller is certainly a theme I am hearing from bankers and industry professionals. If you are of a mind to continue trying to make the branch into a destination to drive traffic, let me introduce you to Sisyphus. Going to the bank is a chore. Boom. So what about these big branches that we all have? An industry stock analyst told me that big banks have advantages over small banks because they can pay for increased compliance expenses by closing branches. The community FI may not have this luxury. But big banks have challenges here, in my opinion. Many have built palatial branches that have no discernible value except as a bank branch. 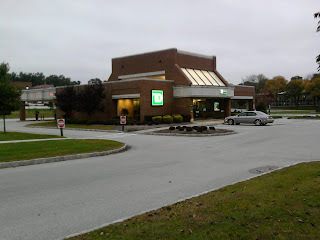 The poster child of this concept is Commerce Bank of Cherry Hill, New Jersey which was acquired by TD Bank (see photo). Their brand is wrapped around their number of branches, the primo locations of their branches, and the look of their branches. But if branches become less important, and big banks can consolidate one branch with the one in the next town over, what are they going to do with the palace? These branches are very expensive, are fixed assets on the bank's books, and are 100% risk-weighted for capital calculation purposes. In other words, you have to carry more capital against the branch than a bond in the investment portfolio that might be 20% risk-weighted. The pictured TD branch is about 100 yards from the Wells Fargo branch pictured below. Sorry for the poor focus but I took the picture with my phone while walking so cut me some slack! If Wells decided to consolidate this branch, it could easily be converted to an office, a hair salon, or a coffee shop. In other words, Wells could sell it and, current real estate market woes aside, can probably sell at a gain. The buyer can convert it to whatever they want. TD, on the other hand, may have to devalue their branch because they can't sell it. Or if they can, it would be for the land and the buyer may have to raze the building to something more functional. Think of all the empty gas stations dotting the landscape. To be fair, the Wells branch had $52 million in deposits and the TD branch $130 million at June 30th. But the old Commerce was known for large branch deposit sizes because they aggressively pursued municipalities for their banking business. So aggressive, indictments were involved. But I digress. 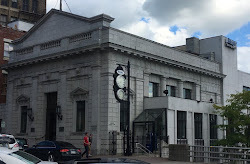 The TD branch does have more deposits, and perhaps this is partially due to the palace. But as we determine our next step in branching, we can't ignore the trends that are telling us that transaction processing in branches is becoming secondary to something else. As branches decline in prominence, we should plan our next branch with the gas station in mind. We don't want to manage multiple properties of former branches that sit stale on our books eating our capital. What is your opinion of what the "next" branch should look like? Great article. It is odd that consumers are so attached to the branch, but I think it comes down to trust. USAA doesn't branch, but has lots of trust. When banks truly embrace branch as just another channel, we'll start to see some progress – and fewer branches. On your point about closing branches, I met a banker at BAI who increased accounts 30% when a large bank closed the branch next door. A good deal for the small bank, but clearly the bigger bank hadn't established the trust needed to keep accounts. You mentioned the coffee shop theme, but that seems misplaced to me. People who hang out in coffee shops either have lots of time (under-employed) or need free WIFI (low wealth). They seem like a poor target for banks. The high wealth folks breeze through the coffee shop on their way to a meeting. It seems like poor market research to expect coffee shops to attract the right crowd. Banks do need to reduce or re-purpose branches to control their costs, but first they need to engage their customers in a way that builds trust. That is excellent insight about how a bank must prepare itself for branch closures. Although establishing trust should be part of the business model all along, asking a customer to stick by you as you leave their town requires a more solid bond. Thanks for your input! Occupy Wall Street: Occupy This!